Condo Septic Actually in NYC Watershed? One of the things I have kept thinking about since the articles in the Daily Star and Daily Gazette about Oorah buying Scotch Valley was their reluctance in purchasing Scotch Valley if the septic is inside the NYC watershed. 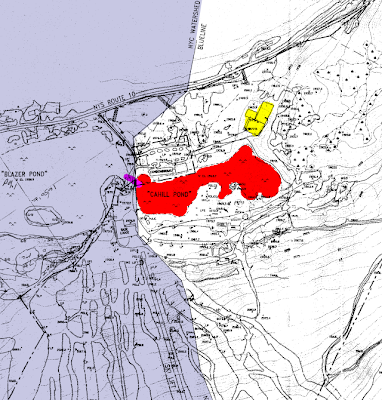 I a pretty familiar with the watershed map and while Cahill pond (Red) is not in the watershed on the map -- it is connected by a pipe (purple) under Scotch Valley Road to Blazer pond which is in the watershed (I believe that it is the headwaters of the Delaware River). From what I have heard Cahill pond didn't exist when the watershed lines were determined. Now this is important because it looks (from looking at the map I have) that the septic leach field (Yellow) for the condo's is very close to Cahill pond. This could be a big issue for Oorah if the DEP decides that all of Scotch Valley is in the watershed. I have put in a request with the DEP I have asked them to look into this right away. Hopefully this can be resolved before Oorah has to commit their money to purchased Scotch Valley. I am sure they would not be happy to have this be a suprise. If you share these concerns please contact the NYC DEP.